﻿ Atom Poison Wheels - $30.00 : Bruised Boutique, For Derby. By Derby. Atom's "go to" wheel for any surface. Never worry about sliding again! Atom created this Hybrid wheel when they noticed many derby skaters in need of a wheel that was not too narrow and sluggish. Now you can have the best of both worlds with grip, roll and amazing lateral push. 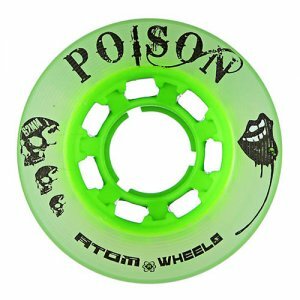 Atom's Poison wheel will provide awesome grip and this Hybrid wheel can be used on any surface. Great for Outdoor Tracks, Slick Sport Courts, Banked Tracks and Dirty Wood Floors.